Ziger/Snead, a Baltimore-based architectural design firm, is pleased to announce that their design for The Center for Parks & People at Auchentoroly Terrace has been awarded an Award of Merit from AIA Maryland in the Unbuilt category. The project includes the restoration of an abandoned nine-acre portion of Druid Hill Park, complete with public demonstration gardens, recreational opportunities, and urban forestry research fields. 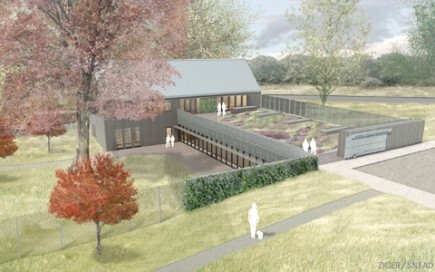 The fire-damaged historic superintendent's house will be restored for use as a community center, and a new facility designed to the highest standards of sustainable design will serve as an environmental resource center, reference library, public meeting rooms, and headquarters for Parks & People. A commitment to the environment is central to Parks & People Foundation's mission. The design incorporates and showcases sustainable design practices throughout the building, which will seek LEED-NC 2.2 Platinum certification from the United States Green Building Council, as well as Sustainable Communities and New Markets Tax Credits.